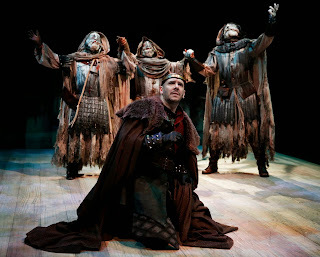 Once upon a time I went to a show and it was called Macbeth. It was by William Shakespeare and it was adapted and directed by Kirsten Kelly. It was about a man named Macbeth (Chris Genebach) who wanted to be king because these witches (Kevin Cox, Tiffany Yvonne Cox, and Andrea San Miguel) have told him he will become king and he wants to be king as fast as possible. 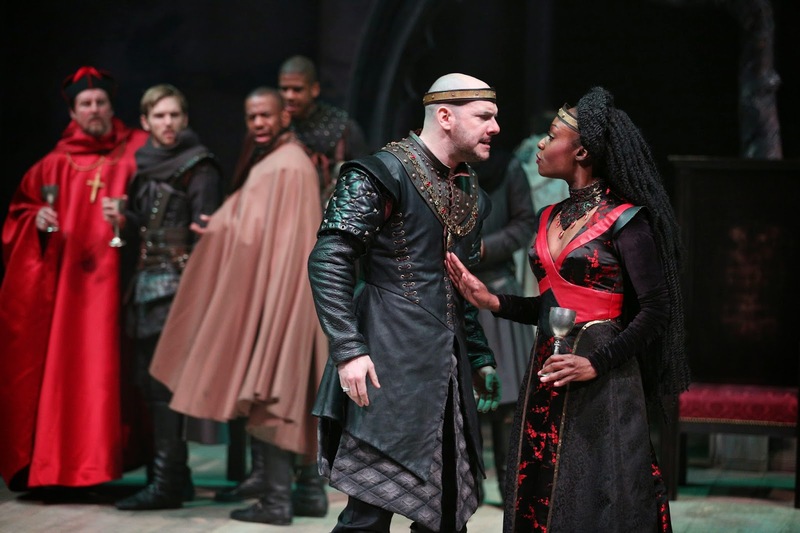 And his wife, Lady Macbeth (Lanise Antoine Shelley), told him that he could become king faster if he killed the current king, Duncan (Jeffrey Baumgartner). But, of course, I don't think his wife was really thinking through these ideas because at some point someone will eventually find out that he killed the king and he will probably get his head chopped off or something. It is about war, magic, and regret. I really really liked this show. I thought the adaptation and acting were great and that they didn't make it so kid-friendly that it wasn't scary, but it wasn't so scary that kids can't watch it. I though that the witches were super awesome. They wore these crazy creepy masks (designed by Melissa Veal). They were so creepy because they basically didn't even have faces because their faces were like spider webs with eyeholes, and that was very creepy as you can probably imagine. The witches had each a very distinct character because they each had a different distinct voice, which made them more interesting. Usually they all just have a classic witch voice. But here only one of them (San Miguel) had a classic witch voice. Kevin Cox had a Smaug-like voice and Tiffany Yvonne Cox had a more insane-person voice, like she was seeing things that were not actually there. I found that part quite scary. The witches moved around on stage like they were trying to hide from something constantly. I thought that was terrifying because you felt like there could be an apparition or a creepy baby right behind you at any moment. I liked how they were possessed by different apparitions and they would talk in different voices. That was very cool because usually they just have other people being the apparitions instead of the witches being possessed. Macbeth and Lady MacBeth were both very much in love but maybe too much in love because Macbeth takes her advice no matter what it is. I don't think that is a very good marriage because I feel like you should keep a marriage interesting by not just agreeing with everything the other person says. I think they should have gotten divorced or just left and forgotten the whole thing so that then they could both live happy lives instead of going crazy. I liked how Macbeth was very loyal to his wife and he seemed like he loved her very much, so it was sadder when she became evil. I liked how Macbeth acted when he was around Banquo because he seemed like his best friend but then when he had to kill him, he didn't really seem to care. I liked that transformation. And when he sees him as a ghost, he acts like Banquo is really there, not just a trick of the eye because, when he was over there, he was trying to push him out and he acted like "You are supposed to be dead not right here at my party. I'm trying to have a good time with my friends who are still alive!" Lady Macbeth just seemed so insane and evil and you hated her so much--in a good way. I don't think they tried to make her sympathetic and that was a good idea because, when they do try to make her sympathetic, she can never be because of the horrible things she is doing to people. Instead when you watch it you should just revel in how evil she is because you like to have a wicked character because then, when the good guy wins, you just feel so happy. 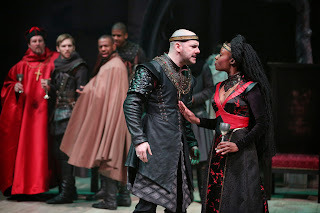 I liked how in the scene when Macduff (Nicholas Harazin) comes to see Macbeth and the king, he comes with his wife Lady Macduff (Tiffany Yvonne Cox). That's not how it always happens, but I liked how they did that so they had more women who had larger roles. She gets to say all of Lennox's lines in the scene and I thought that was cool. I think in this version of the show it seemed like there was more than one clever woman, and she wasn't clever for evil purposes. And it seemed like the Macduffs' relationship was a good one because they seemed happy together before he had to flee. I though Lady Macduff's murder scene was so sad because she was just with her little baby and it was just a few seconds after talking to her cousin Ross (La Shawn Banks) and this man (Baumgartner) had told her that she should run away with her children and everyone who was there because there were murderers coming. The scene where Ross went to tell Macduff that his wife was dead was so sad because you could see they were all in shock, but then Malcom (Steven Lee Johnson), who didn't really know these people, was like "Take it like a man" and I wanted to punch that character in the face. Of course he should take it like a man, but men can cry. People who would like this show are people who like awesome witches, dynamic duo couples, and creepy babies. I think people should definitely go see this show. I had a lot of fun seeing it with my friend Lana; sometimes we both needed to hide from the witches. I really had so much fun at this show. It was so scary, but it was so much fun. Once upon a time I went to a show and it was called The Selfish Giant. 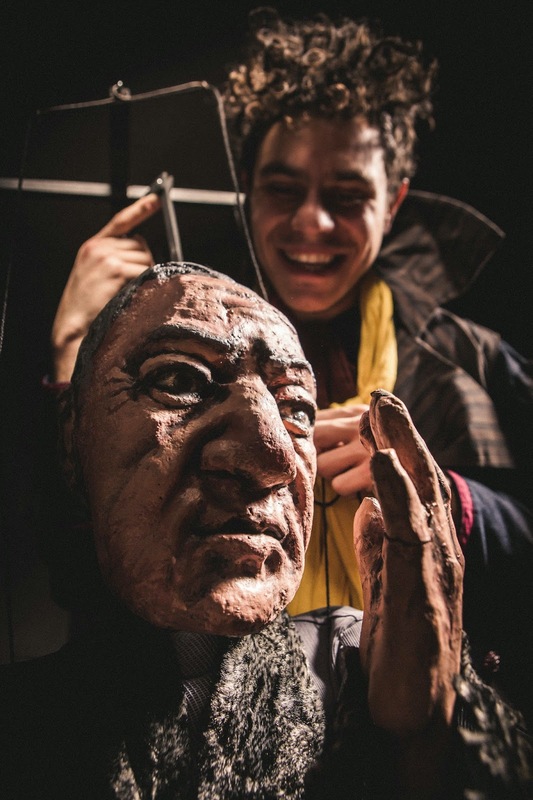 It was created by Blair Thomas and Michael Smith based on the story by Oscar Wilde. The puppet designer was Jesse Mooney-Bullock and the puppeteer is Sam Deutsch. Michael Smith also did the music, wrote it and played it. It was about a Giant who lived in a garden and a bunch of children had wandered into his garden while he was gone and he got very angry. It is about sharing, kindness, and how not to judge a book by its cover. I think that this is a very fun show because it uses a bunch of elements of theater that are some of my favorites: music, puppets, and adaptations of books that don't leave much out. I really really liked this show. I think it is fun for adults and for the whole family. 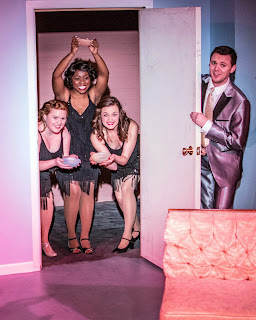 And for kids who have never seen many plays before, it introduces them to a bunch of genres of plays all in this one play; it is a musical, a comedy, a puppet show, and it has a very bittersweet ending. I really liked the music. I thought it was childlike but still adults could like it and it would get stuck in their head. One of my favorite songs was the one about Old Man Winter. He sort of reminded me of the Polar Vortex, like he stayed for way too long in the Giant's garden. I liked the song because it was very catchy and it was kind of a chilly blues song. There was a line that went something like, "I'll come on down to the Giant's garden and freeze it all up with snow" because there were no children there. So, I guess he had kind of a kind heart because he didn't just want to freeze up children's homes, but still they were sad because they had no place to play. Another song that I got stuck in my head is one the Giant sings about "Why should I share? I'm a giant, I can do whatever I want." He says, "What? Share? Who? Me?" and he sort of had a little bit of a squeak that made the Giant's voice distinct from the others and it made it funny! I think it was cool how the person who did all the music also did all the voices and the puppeteer was kind of like Harold Lloyd in a silent movie; he communicated with motions and facial expressions. 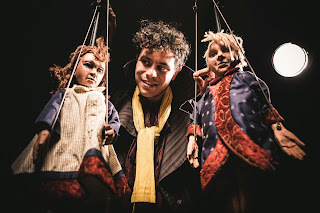 The puppets I thought were amazing looking. They looked like actual people. Like the Giant had wrinkles on his face and the children had almost completely smooth faces and yarny and all-done-up hair. I think that the Giant was really awesome because he was basically like a Big-Bird type puppet where someone gets into the puppet and moves around in it so they look like something that they are not-- like a puppet Halloween costume. My favorite thing about the huge puppet was how realistic his hands and his face looked. Old Man Winter was very cool and also the three other seasons. Old Man Winter had a very pointy, evil-looking beard. The other seasons basically looked like Greek gods and goddesses and had an element from each season on their heads or their outfits. Fall reminded me of Hephaestus because of his outfit and how he seemed like a hardworking man who could do blacksmithing everyday. One puppeteer managed to make the three season puppets move their mouths at the time they were supposed to be talking. He probably had to memorize the order because sometimes they were basically arguing with each other very very quickly. The adaptation of this was very cool and fun because they didn't leave anything super important out and they didn't add anything in that didn't have to do with the story. I liked all the references to Chicago and those weren't in the original, but still it was a very fun reference to have. It made the story feel all the more personal. The puppets reminded me of how they described the characters in the story. The story was not very funny, but they made it funny because Oscar Wilde was famous for writing funny plays. And I thought that that wasn't just changing the story. I thought it was paying Oscar Wilde homage. Another thing I liked about the show was the use of the bird song. In the book they talk a lot about birds, but they never really have the birds have a say in anything. In the show the birds have a bird song with these beautiful bird puppets. People who would like this show are people who like awesome puppets, catchy music, and giants. I think people should definitely go see this show. It is such a beautiful, artistic piece, and I really loved it! Once upon a time I went to a show and it was called Plastic Revolution. The book was by Will Cavedo and Andrew Hobgood, and the lyrics were by Hobgood. The composer was Julie Nichols. 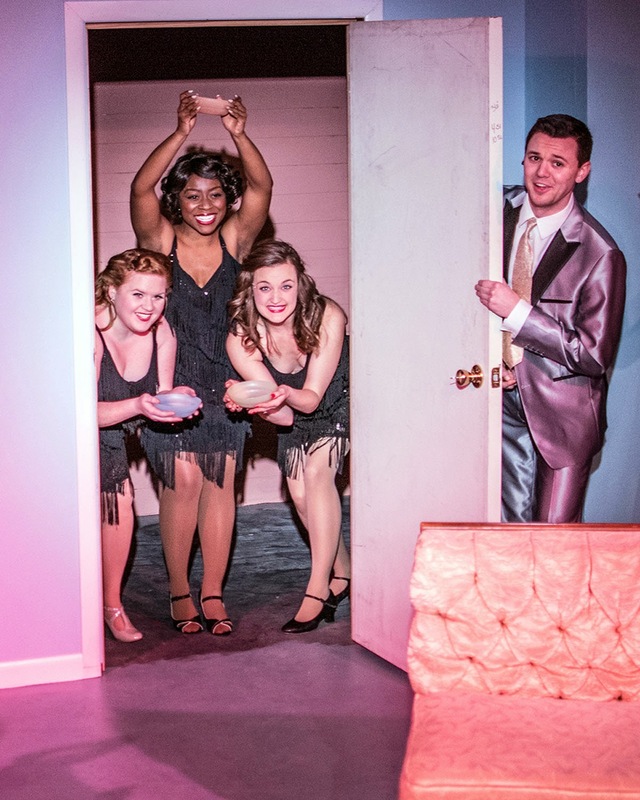 The director was Evan Linder and the musical director was Charlotte Rivard-Hoster. The choreographer was Steve Love. It was about Tupperware! I know that doesn't seem like much of a plot but it actually is because it is about the early Tupperware parties and how they were run and how Tupperware got big. It is also about what it is like being a housewife and how Tupperware would save you two hours a week to just be yourself. I think that people should definitely go see this show because it is just a load of fun and it makes you feel very happy because it is such a funny and surprisingly touching show. 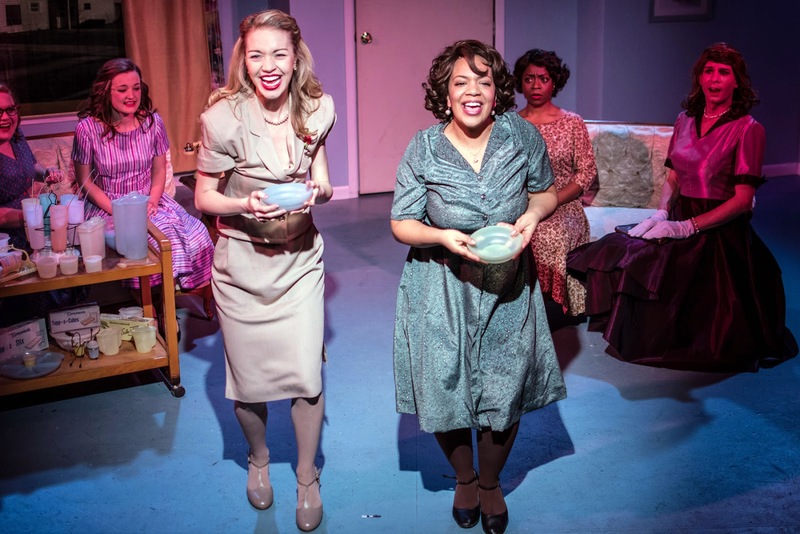 There is this woman named Delores Clarke (Sasha Smith) who had just lost her husband (Joshua R. Bartlett), and then one day Brownie Wise (Cassie Thompson) came to her house with an idea to have Tupperware parties and she wanted Delores to be one of the saleswomen. Brownie was basically the hyper one and I thought that her kid sounded like they should probably have him checked out at a hospital or something to see if he had eyesight problems…or worse. And Brownie presented her idea with a song and dance with basically the ghost of Delores' husband tap dancing! I loved the costumes (by Nathan R. Rohrer). I thought they were awesome and I would wear all of the dresses any day of the week. And the dance was very old-fashioned and I love old-fashioned dances and the choreography was great. During the scene Brownie was trying to pitch the idea to Delores and they placed a crown upon Delores' head and a giant head of a comic-book-designed woman just rolled itself out. There was also a giant dancing Tupperware bowl (Danny Taylor), and you don't see that everyday, and I found it hilarious. It was exactly like an old-fashioned commercial! I really liked the song "Two Hours." It was a very nice song because it is about how these women want to be able to have two hours a week to be themselves. So then they would feel like they are not just a wife but also whatever they want to be. There is this woman named Gladys (Lizzie Schwarzrock) who used to do pageants and then when she got married she couldn't do that anymore because she had a husband and a kid and she had to cook meals and clean the house. And they had these really cool portable household things that they would be doing as they sang. Gladys was ironing. I thought that those wearable props were really awesome. Gladys's character seemed like the least bright one, but I think she still deserved some time in the day to just think about pageants. I really liked Gertie's (Elise Mayfield) part where she was doing the dishes. She wanted to go travel everywhere and see the world. But when she became a wife she had to give up that dream. And that is why these days men can take off work so they can go on a vacation with their family. Kitty Toots (Daeshawna Cook) used to be a jazzy blues girl who was naughty all the time. But then she thought she had to get married because her parents hadn't been. She was rolling a pie crust out for dinner. And I felt sorry for her because she just wanted to be able to dance and sing every night and have a few beers. Maybe a shot of gin. And she couldn't do that because her husband wanted her to be a proper housewife and stay home and work. I think this song was very great because it showed what housewives used to do and how when their husband got home and their kids were in bed they couldn't just sit down and talk about their day while they had a beer. The man could, but they couldn't. And I felt like these women should be able to have all the same privileges as men. I really liked Lilah Johnstonton (Taylor) even though she was sort of the bad guy; you felt sorry for her because she didn't believe in Tupperware. She thought that it would just make women want to abandon their families and leave them all alone with no one to cook for them. There is this very sad solo song that she sang about what had happened to her and why did no one want to talk to her or have tea with her anymore. And she was knitting this giant scarf which I found really funny because the scarf was like insanely long. And when Kitty came in, she said, "Well, that scarf looks, well…done." I really admire the person who had to just knit that for a very long time and be absolutely patient. I think that Danny did an amazing job at playing this woman. He just blew me away with how he embraced the character and made her still likable even though she was such a jerk and did not believe in Tupperware. People who would like this show are people who like old-fashioned commercials, Tupperware, and insanely long scarves. I think this show is very great! It shows you how Tupperware became such a big thing and helped so many women. I never thought of Tupperware being so feminist but now that I think about it, I think that it actually is. 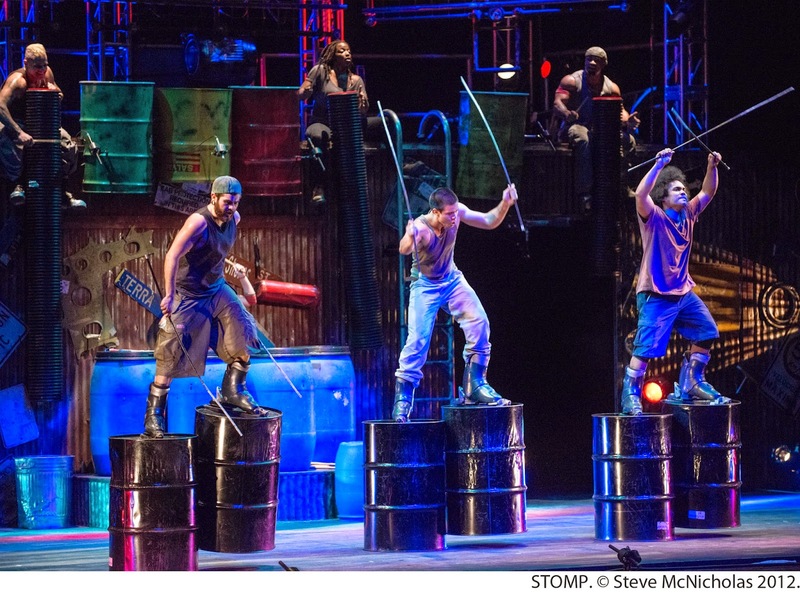 Once upon a time I went to a show and it was called Stomp. It was created and directed by Luke Cresswell and Steve McNicholas. It was a dance show, but it was percussion plus dance. There were a bunch of different sections where they used everyday objects to make music. Like they would use the sound of a broom as a beat. They make music with stuff that you would never think could make such cool and awesome music. Like who would think a paper soda cup and straw could make music that sounded like it was from the Zelda video game? I had so much fun at this show. The entire time I was laughing because of the little snippets of comedy or I was in shock because what they were doing was so amazing and out of this world! The things they had to do physically to make the music were sometimes very physically demanding, so then when you saw them actually basically defy regular human abilities, you were amazed! If someone makes one wrong move the whole scene can fall apart, but the entire time it was just completely spot-on! There was a lot of use of everyday things to make music. There was a scene with shopping carts and they all were running into each other and making awesome music. The shopping carts had a water jug and a box in them and they would like throw them up and down, then go back to the shopping cart, then throw them up and down. And they hit them with sticks. And it was so amazing that with just a shopping cart, a jug and a box, you could make such awesome music. I hope it is on iTunes! One of my favorite scenes was when Ivan Delaforce, Alexis Juliano, and Kris Lee were all searching through the garbage and they were making music with whatever they found. Lee blew up this bag and started squeaking it and squeaking it. And one of my other favorites was when she used the Coca-Cola cup. And Delaforce found a little box that he would tap and it made some awesome music. And Juliano had these garbage bags that she would throw and then pat, throw and then pat. The accuracy of the timing was so important in this and they all did an amazing job with the timing. 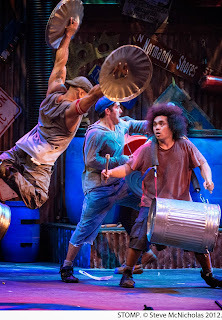 I loved how they juggled the buckets. 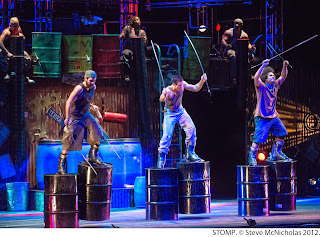 I liked the different moments of seeing all the buckets in the air, then they come down and go up again. They were all throwing buckets and when they threw the buckets, they were all throwing them at the same time and another person, who had probably just thrown a bucket, had to catch it! I know they practiced a lot because I don't think anyone on earth could have done that amazingly if they hadn't practiced for like at least 3 hours a day. And every time there was a little bit of suspense, even though you were almost positive that they weren't going to drop it. This show was not only a dancing show, it was also a comedy show. But they still didn't talk. They made it funny just by looking and the music and how silly they made it and how they acted. One of my favorite parts was when Hall and Fernandez started picking their poofy hair. With Hall it was with his beard. That was funny because two people just coming into the same room and picking their hair together is silly. What is this? Like the grooming break for everyone? And they were sort of competing, but then Fernandez stuck the pick in his hair, and was like, "Yep. No one can see that." I thought that was really funny. One of my favorite funny scenes was the newspaper scene where everyone was reading the newspaper in a little circle. Everyone seemed to crowd around Fernandez and the rest of the stage was empty. Then all of them started making these noises with the paper and tearing them up, which is not what you should do with a paper that you're reading. And then at the end of the scene he taps on his teeth three times with his pen, and they'd all been making so much noise before, but they are like "SHHHHH!" People who would like this show are people who like newspapers, shopping carts, and flying buckets. This show is so great because there is nothing else like it at all. It is such a great experience. I loved it so much and I had so much fun! Once upon a time I went to a show and it was called The 236th Annual Summit of the Moose Scouts of America. It was by Jessica Wright Buha and Aileen McGroddy. It was directed by Aileen McGroddy. It was about these two Moose Scout rangers named Ranger Jeff (Isaac Samuelson) and Ranger Jane (Annie Cleveland) and they are giving a presentation about Moose Scouting and what they are going to change because they want it to be more about hunting and wilderness stuff so they will be prepared if there is a giant man-eating rat infestation. What happened is that they wanted to show that everything would be okay if they did this. But it meant that they had to give up a bunch of awesome badges to make room. They were all like Girl Scout badges, like knitting, sewing, baking, stuff like that. They didn't use to be like surviving-a-wolf-attack badge. I think this show was very fun. It was funny but scary to think about what the Girls Scouts would be like in the dark future where there are such things as man-eating rats and the world is just freaking messed up. I really liked Ranger Jane. I thought that her character was basically like what the man usually is in an old-fashioned western. Jeff is the one who got his badge for solving a problem, but she got hers for defending herself from wolves. I liked how she was so obsessed with her knife, and for the entire time when all the audience was getting in and Ranger Jeff was talking in a a sweet kind way to everyone, she just continued sharpening her knife. And then whenever there was something about a knife in a story or something she would hold it up to the sky and then point it at the audience, and then Ranger Jeff would be like, "Don't point it at the audience" and he would hide it in plants. And that was very funny. Ranger Jane also got very angry at the projector and ripped it up and said, "It had to be destroyed" in a very grim voice. And then Ranger Jeff would say, "Well, that's what you had to do, Ranger Jane" because he was talking earlier about how you have to help fellow Moose Scouts if they are in a state of distress. 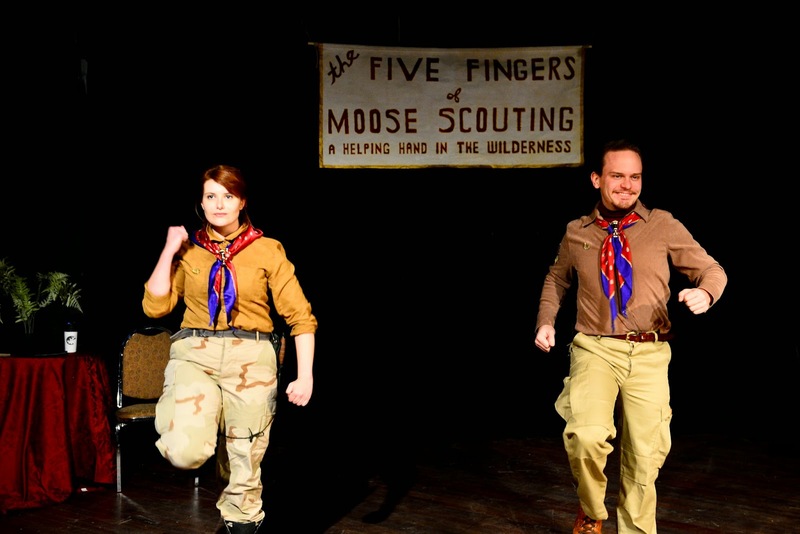 The five fingers of Moose Scouting were basically the rules of the Moose Scouts. They were called this because their founder had chopped off her hand to feed to these animals so she wouldn't get eaten. 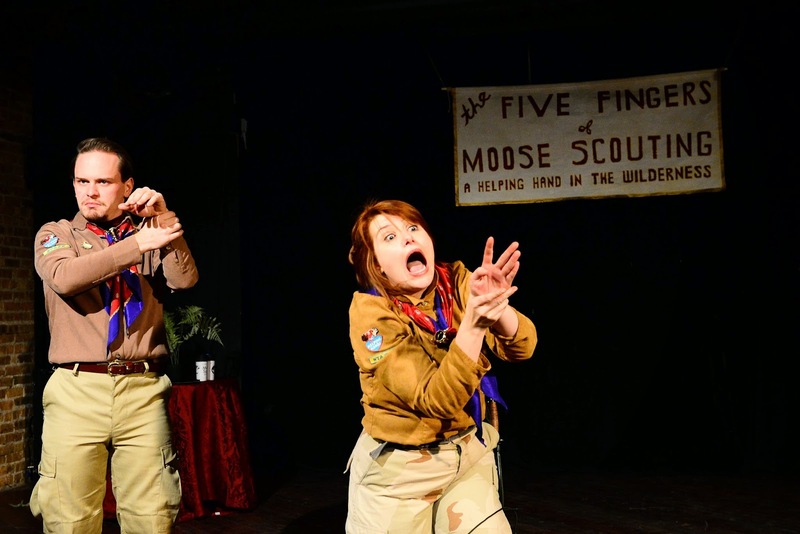 I found that so weird, but gross, but hilarious because no sane Girl Scout people have rules about a severed hand! And basically the main ideas behind Moose Scouting were knives and be nice to each other, and those things don't necessarily go together all the time. I also really liked the dramocumentary which was basically a drama but also a documentary that they were going to watch with their projector, but Jane basically destroyed the projector so then they had to act it all out. And that was really funny. It was funny because they were doing these overacting moves and had a very batman-sounding narrator. The dramocumentary was was about their founder and her glove-making skills. I thought that was pretty funny because she went from sewing gloves for everybody in the town to being a wilderness explorer! Ranger Jeff was the sweet one of the Moose Scouts. He was just like, "I want to have fun all the time!" and Ranger Jane was always like, "Let's go kill some things!" At the beginning he would come around and talk to people in the audience and tell them all his badges. I really liked the donut eating badge because who just has a stomachache to get a badge!? At the beginning you feel like, "He's very enthusiastic. Ranger Jeff seems like a nice guy." But then closer to the end you are feeling like, it is just not working to be enthusiastic with Ranger Jane, so he should just try to be like her for a little bit and that might make her feel better. Jane understands better than Jeff that they are not in a nice world. Jeff just wants everyone to have fun, but the circumstances are not the best for just goofing off and having fun. That makes you feel like Jeff is trying to do the right thing but he is not in the circumstances to be doing the right thing. I think that Jeff was very very funny singing the Moose Scout song because he just had a giant smile on his face, and Jane was off to the side being very very serious and marching and doing the moves to the song. Me and my mom have been singing it (music by John Szymanski) all week! The song showed that the Moose Scouts used to be the dippy people but now they have to be all about wilderness and surviving man-eating rats. There was one part where they said, "Never let despair, worry your pretty hair." Wilderness survival is not usually about cutesy pretty hair or giving each other high fives, which is also in the song. People who would like this show are people who like high fives, moose, and knives! I think people should definitely go see this show. I had a blast at this show. It is just so weird and so enjoyable that I was basically laughing the entire time! Once upon a time I went to a show and it was called Spinning Into Butter. It was by Rebecca Gilman and directed by Andrew Pond. And it was about a woman named Sarah Daniels (Jessica Lauren Fisher) who worked at a college that was mostly white people. And the big thing that happens at the start of the story is that there is this African-American student who is having racist notes put up on his door. And Sarah is put in charge of the student affairs and so she has to help him with what is going on. And she as a white person doesn't really know what to do at first except say, "racism is bad, you are on your own now." She doesn't do that, but it is hard for her not to just do that. And Burton Strauss (David Blew) is bossing Sarah around and saying that he hates racism but then he is just talking about how racism is bad and he doesn't give any ideas to people or listen to what black people have to say. I really liked this show. I thought it was very interesting in the way they talked about race, not like some other plays where they just talk like the people do in this play and say "Racism is bad" and then they are just like "That is all I have to say." By the end Sarah learns that she may be a racist but at least she can listen to black people and not just talk for them. I know some of you are saying, "But you are a white person, Ada Grey." But I think this play is aimed at white people to make them be able to just sit next to a black person on the train, and to realize that black people aren't all the same and they don't all think about themselves in the same way. I think that people should definitely go see this show. I thought it was a very interesting show and I liked it. I liked all the students, even the one you don't see, Simon, who basically the whole play is about. It makes me feel like, why if it is all about racism, why not have the African-American character make an appearance? I thought it would be a great idea to have a play from Simon's perspective because then you would know why he felt like he had to do these things, which I cannot say what they are--don't worry, I'm not just being unspecific. Patrick Chibas (Rolo Rodriguez) was a Nuyorican man whose race was not on the scholarship form. And so he had to go in and talk to Sarah and how it wasn't on there and how he circled other. He felt like, why is my race not accepted and also she said that the people who were the scholarship advisers were old and had an old view of the world. I think he seemed like a very strong character because he does not let people walk all over him. He stands up for what he and his parents want. There was another student, Greg Sullivan (Jonathan Helvey), and he was a white student from Connecticut but he wanted to make this club called "Students for Tolerance" that seemed to be about white students pouring out their feelings. And that name just already gives off a bad odor because whites aren't supposed to "tolerate" black people. You should be like, "that is my friend, we should talk." But I didn't think that guy is just a jerk because you see that he is trying. Sarah and Ross (Patrick Iven) were sort of a couple but then the thing was they weren't dating each other because they were each other's type but because they wanted it to seem like they weren't just loners. But then she gets super mad at Ross when his old girlfriend comes back. I have seen a relationship like this in another play about schools, Exit Strategy by Ike Holter. So I think that things like that must happen a lot in schools since people write about them in plays about schools so much. I think Sarah actually found a love for Ross while they were together even though it seemed like she wasn't in love with him. Then they remain friends even after they broke up. When he talks to her it feels like he is giving advice to his wife or girlfriend or something, not just to a friend. When he talks to her about racism, he says that he thinks that even if we are all a little bit racist that doesn't make it right. I think it inspires her to do something good at the end of the play. I won't tell you what that good thing is because it would ruin the entire play. I thought that the actors who play Dean Catherine Kenney (Lisa Savegnago) and Burton Strauss did a great job of making you hate the characters because the characters were insensitive and by the push of a button they could never want to see another African-American person again and by the push of another button they could be like, African-American people are amazing! Burton Strauss is saying that Simon is a con-artist, but the thing is, Simon couldn't understand himself. You'll find out more what I mean when you see the show. They handle the situation by just blaming it on someone else. They don't say, "I'm sorry, that was me. I made a mistake." They are like, "That is all her fault" or "That is all his fault." And that is not a good way to run a school. Basically the opposite of these two people, is Mr. Myers (David Elliott), who is the school guard. He is one of the most kind-hearted people there and he doesn't just learn about African-American people like Sarah did when she was in college. Instead he listens to what everyone has to say. And he learns from that so then he can understand people better. What really showed his kindness was, when he went to go and give a student a ride home, he just asked if he was hungry and he was, so they just went to dinner at a burger place together. He wasn't just doing his job; he was treating him like he was a friend, not like he was just a student he was giving a ride home. People who would like this show are people who like interesting and awesome plot twists, understanding yourself and other people better by watching a show, and burgers. I think people should definitely go see this show. I think it is one of the most interesting and mind-puzzling shows I have ever seen. It made me think about how other people see me if I just walk past them. Once upon a time I went to a show and it was called New Year's Eve Improv Show and it was at Laugh Out Loud Theater. It wasn't centered around a theme; there were different games and then they would play those games and we didn't know what they were going to say, and they didn't know what they were going to say. I really like improv because it really shows the creative side of a bunch of actors. You can just make up something on the spot and it can be hilarious. I had so much fun at this show, and it was a great way to spend my New Year's Eve. I think it would be a great way to spend any day! I really liked the traveling game, where they send one person out of the room so then they don't know what they have to guess. And then they ask the people in the audience to add on to what they are going to say. So when Jin Kim goes on the plane, he's going to meet the cast of Glee, not his family or friends or something. So when he comes back in, they have to say to him in gibberish and miming what he is doing. I thought that was really cool and fun. It was hilarious when Jim Vozzella started scootching around in a chair. As a first-season Glee lover, I know what the scootching around in the chair means--there is a guy in a wheelchair named Artie. Also, the audience said that there would be rocks in his suitcase. But the first time Jin thought there were mountains in his suitcase and everyone laughed, and he was like, "What?!!!" And then Jay Gish was like, what are mountains made of? And Jin was like, "Carbon?" Of course it is made out of Carbon, but also it is made out of rocks. And everybody was just laughing hysterically. And then Jin got super super angry and everyone was laughing because he was just so worked up, but when he got it, he was so happy that it was hilarious to see. The board meeting idea was super fun because it was a christmas party at this serious workplace, but then the people who worked there were like basically insane. The leader was basically this drunk girl (Lillian Frances) who wanted it all just to be over so she can leave and go home. But before she went she had to talk about if they needed helicopters. Some people said yes and some people said no. But some of the characters they made up on the spot were just so funny. Like there was this kid from Starbucks (Vozzella) who said helicopters would interfere with the coffee making below. And there was also a girl (Maureen Winston) who really loved guns and violence. And she did want helicopters because she said they needed as much protection as possible. There was also this cowboy (Gish) who didn't have much to say about helicopters. He just basically wanted to talk about how much of a cowboy he was. I thought that the "Home for the Holidays" game was really fun because the person who was guessing (Winston) had lost her job as a astrophysicist and of course if you had gotten that job in the first place, you probably would be able to stay with it. But she didn't, so I found that pretty funny. And, also, her boyfriend was Elton John and Elton John is actually married to a man. There were two cousins (Harz Sondericker and Gish) who came over to welcome home Maureen, and they were basically these cowboys and they wanted to show her that her boyfriend had been Elton John so they came up to her and they were sort of dressed like Elton John and then they were like, "It was like a candle in the wind." And she was like, "Oh I miss Elton John!" And that was funny. I really liked Tony Lentino's performance of the dad because he just seemed so clueless all the time. I don't think dads are usually clueless, but this dad was and I thought it was very funny. People who would like this show are people who like great improv, fun & games, and Elton John. 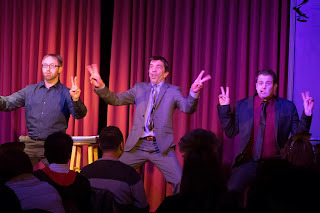 I think that people should definitely go see Laugh Out Loud's shows. The performers could say anything: it could be funny, or it could be just straight-up weird. 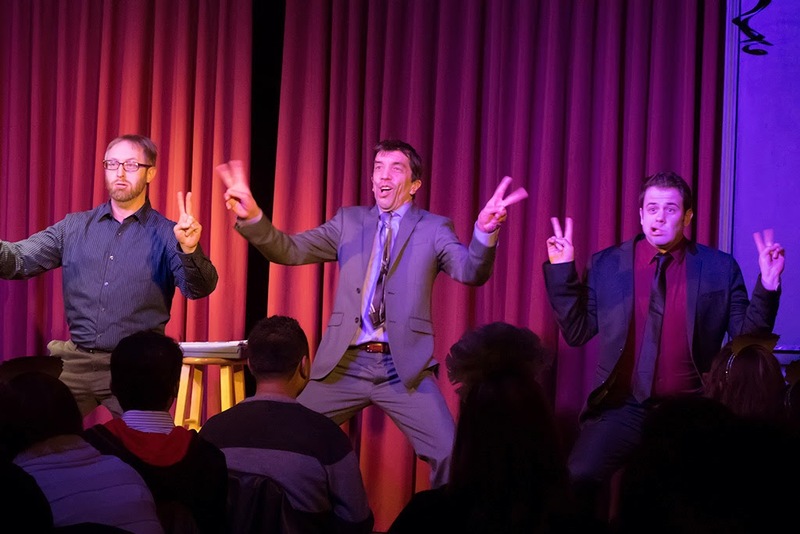 The shows are a load of laughs and a great way to spend your evenings!